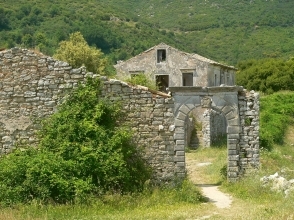 Old Perithia is a ghost village on the northern side of Corfu, just 8 km from Kassiopi. Constructed on the slopes of Mount Pantokrator, at an altitude of 650 m, Old Perithia is a wonderful place to visit. A walk around the village will impress visitors. Most houses and public buildings were built with the Venetian style. Today these houses are almost ruined, so visitors will see broken window shutters, rusted doors, crumbling stone walls, closed churches and gardens with broken flower pots. 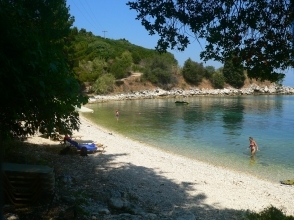 Kalamaki (Apraos) beach is a large beach between Kassiopi and Agios Spiriridon. The beach is also know as Apraos and both names are used equally which is a bit confusing. The beach is wide and sandy wich makes it perfect for small kids. There are some restaurants and beach bars with sunbeds and parasols. The surrounding area has several hotels. Syki Beach is a small, secluded beach with white pebbles, turquoise waters, surrounded by vast vegetation which reaches almost until the sea.